The Pony Scouts books are part of the I Can Read series, and they are designated as level 2, "reading with help". The books are written by Catherine Hapka, who is also the author of many easy readers based on movies such as Kung Fu Panda, The Land Before Time, and Rio. They are illustrated by Anne Kennedy. Each story is about three girls - Meg, Annie, and Jill - who call themselves the Pony Scouts because of their mutual love for ponies. I read three titles from the series. 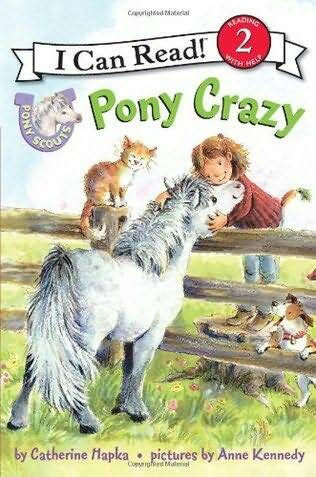 The first book, Pony Crazy (March 2010), sees Meg moving from the city to the country. At her new school, she meets Jill, whose mother has a pony named Sparkle. Jill invites Meg to hang out with her and Annie after school. After visiting with the ponies, the girls come up with the idea for the Pony Scouts. In the second book, Really Riding (July 2010), Jill's mother gives Annie and Meg their first riding lessons. No one is allowed to ride Rosy, who is new to the farm, and very fat. Later that night, the girls sneak out to the barn, only to discover that Rosy has given birth to a foal! Back in the Saddle (March 2011), the third book, also focuses on riding lessons, but this time, Annie falls off her pony! She is reluctant to get back on and ride again, but Jill reminds her that the best way to recover from a mistake is to put it behind her. After taking a moment to visit with Surprise, Rosy's foal, Annie decides it's worth another shot, and this time, she successfully completes the maneuver that knocked her over the first time. Ponies and riding are topics of definite interest to this age group, so the subject matter alone makes them a sure hit. I also really like the way vocabulary is incorporated into each story. Words that might be new or unfamiliar are defined on the last page in a short glossary. The illustrations are warm and inviting, but they also really supplement some of the new information introduced by the text. The girls are shown wearing helmets, mounting ponies, and windmilling their arms in what I assume is the correct way to do such things in real life. The books also provide lessons on friendship, perseverance, and animal care, and throws in occasional snacks and sleepovers to supplement all the pony stuff. I am not a pony person, but these books are new favorites for me.